Returning for its third year, Carnival of Giants is now just one week away and there is a real buzz of anticipation in the air as the final preparations are being put in place for this enormous event. 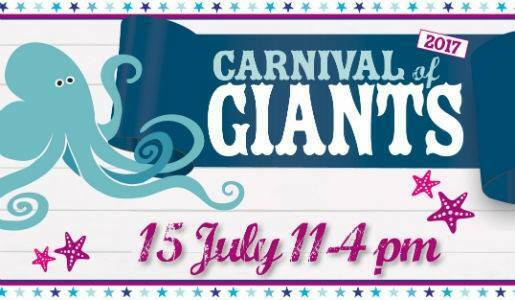 This year on Saturday 15 July Telford Town Park will come alive with GIANT sea creaturesas they take over the QEII Arena and amaze children and adults alike with their sheer size and scale. The ever popular parade will begin at 1pm and this year people are being asked to line the road around Telford Shopping Centre (Grange Central) to wave the parade through to the park. This will feature a GIANT discoturtle, Neptune, jellyfish and the genuine TB4 submarine from Thunderbirds along with members of the community dressed for the occasion showcasing their own creations. The fun doesn’t stop there. As well as seeing the amazing parade, there’s so much more to experience. There will be a life size sperm whale in the main arena who after many suggestions onsocial media has been named Herman for the day. People can come along and see this spectacle and take photos with the whale. After the parade the disco turtle will be parking up in the arena and creating a buzz with music. Also come and see the TB4 up close and get a snap with the real submarine from Thunderbirds. Don’tforget Southwater beach where the GIANT deckchair will be along with other deckchairs where you can sit back and relax and have a glass of whatever while the kids play in the sand. If that isn’t enough there is also crafts, sports activities, food stalls, a fun fair and more.